An adventure game in which we play detective Michael Stone, trying to explain the mystery of the death of a couple. While playing in Rainswept, we travel through the sleepy town of Pineview, talk to its inhabitants and solve riddles. Rainswept is a story-driven adventure game developed by Frostwood Interactive - an independent studio from India. In Rainswept players assume the role of Michael Stone. The detective arrives in the town of Pineview to help the local police solve the mysteries of the death of Chris and Diane, who were found dead in their kitchen. The residents of Pineveview believe that it was a suicide, and these speculations are fuelling rumours about the turbulent relationships that prevailed in their relationship. The task of Stone and his companion, Amy Blunt, is to discover the reasons behind the death of the couple. It is complicated by the fact that, as the hero progresses, he falls victim to memories from his own past, which have an even worse impact on his mental health. In Rainswept the action is shown from the side perspective. during the game, Stone walks through some gloomy locations, where he looks for further clues to help him carry out the investigation to the end. The hero has to interact with neutral characters (as well as interrogate suspects) and solve various environmental puzzles. In addition, from time to time the game allows us to take control of Chris, whom we accompany during the key moments in his relationship with Diane. 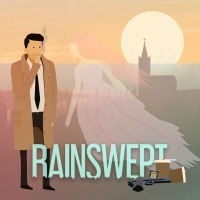 Rainswept has simple and cartoon-like 2D visuals. Players are accompanied by an atmospheric soundtrack written by Micamic (his songs can be heard in such positions as Downfall, The Cat Lady or Lorelai).